VietNamNet Bridge – Parents cannot understand why their children do very well in school, but have low scores at national exams. Analysts blame the disparity on the so-called achievement disease. Song Tra, a teacher at Huynh Thuc Khang High School, said days ago that he heard a complaint from a neighbor that his daughter only got 10.2 score in total (less than 2 for each exam subject) on the high school entrance exam. 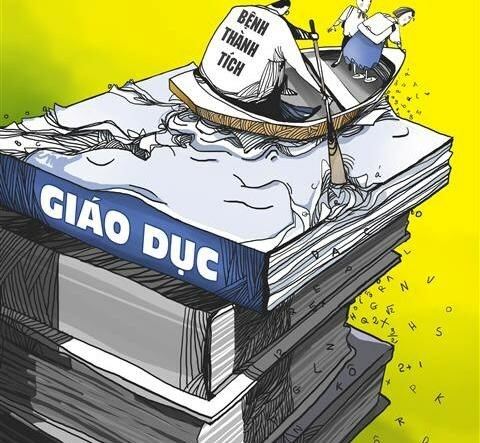 And a colleague of Song Tra, who is proud of his son, a 12th grader at a high school for the gifted, was astonished to discover several months before the national high school finals that there were many gaps in the boy’s knowledge. Only after a lot of effort did the boy fill up the gaps and attend the finals in late June. Many parents believed that their children would get high scores at the national high school finals because they had high scores at school and reports showed they were excellent students. However, when comparing the students’ exam work and the official answers given by the Ministry of Education and Training (MOET), they realized that many answers were wrong and that their children were not as excellent as they thought. “My child was very good at school and his GPA (grade point average) was very high. Why did he have such a modest exam score? Is this because of the ‘achievement disease’ which has been mentioned recently?” one parent said. Song Tra, who spoke about the stories on Giao Duc Viet Nam, said: “You have every reason to have such doubts”. Teachers now tend to raise students’ marks to embellish achievement records. A report released recently by MOET found irregularities in students’ learning and exam results. There is a large gap between the GPA at school and the high school final exam: the average exam score is 2.5 scores lower than the GPA. A local newspaper recently analyzed the reports from some schools and found that students are ‘abnormally excellent’. About 30-40 percent of students meet the requirements to be recognized as ‘excellent students’, while the proportion is 50-60 percent in some localities and schools. The figures are even higher at schools for the gifted or classes for the best students. The scores at schools have been especially high in the last four years. Around 80-90 percent of students have good marks. Records at schools are considered by universities when enrolling students.